I can’t stop humming the tune I Never Been To Spain. You might remember it, an early 70’s hit written by Hoyt Axton of Three Dog Night. The song is about different life experiences, which is so appropriate for our store. We love love learning about and experiencing new beauty items from around the world. No, we’re not all a bunch of globetrotters, but we’ve got connections. The connections are you, our customers who always have the best ideas on what products we should carry. Alvarez Gomez line from Madrid, Spain is a family owned classic perfumery that’s been around since 1899. That’s the year it’s founders moved to Madrid from Leon and set up shop. The fragrance stays true it’s original formula harnessing the refreshing benefits of floral essences and essential plant oils. At the center of the line lies a very refreshing, clean smelling cologne made with an original combination of Spanish lavender, lemon, geranium, eucalyptus, and bergamot. Here are some great items that will refresh your hot summer days. Enjoy! A box of 10 individually wrapped Agua de colonia concentrada perfumed towelettes; a classic scent from Madrid. This is an invigorating and refreshing cologne with a fresh Mediterranean scent. Spanish lavender, lemon, geranium, eucalyptus, and bergamot. The freshness of Agua de Colonia Concentrada captured in a bar of soap. Enjoy this great product in your shower! Agua de Colonia Concentrada’s classic scent captured in a shower and bath gel with camomile and cucumber. A classic scent imported from Spain. 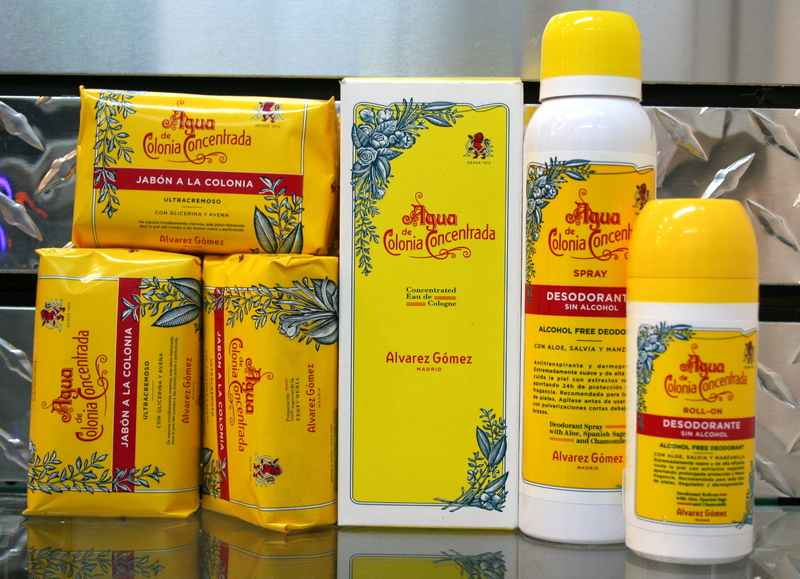 The fresh scents of Agua de Colonia Concentrada in an alcohol free roll on deodorant. The fress scent of Agua de Colonia Concentrada captured in an alcohol free spray deodorant. The fresh scent of Agua de Colonia Concentrada is captured in this travel pack containing a roll on deodorant, body lotion, and shower gel!